Blue sea glass is one of the most favored sea glass colors because blue glass has such an interesting history. The color has been used in the past for everything from the finger bowls of the royals to a farmer’s bottle of arsenic. It is a stand out color that makes an immediate impression. It is bold, not shy, and guaranteed to attract attention. Discover the story of blue sea glass as you scroll down this page. 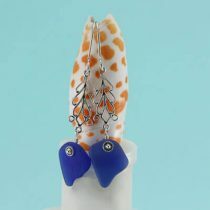 We invite you to peruse our collection of authentic, blue sea glass jewelry in both the cobalt and cornflower blue hues. All of our jewelry is hand made with love and care and everything that you see is ready to ship. 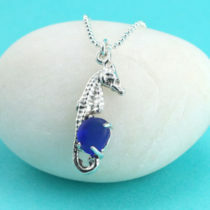 If you’re looking for a gift to commemorate a special occasion or simply want to treat yourself to a piece of beautiful, original sea glass jewelry that will make you happy when you wear it, we hope that you will find it here. 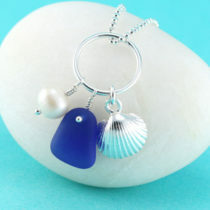 Blue is one of our best selling sea glass colors. One of the most difficult colors to find, it is rare, handsome almost, and most special to discover. Now it’s time to learn more about one of the most sought after sea glass colors! Why Is Blue Glass & Sea Glass Blue? 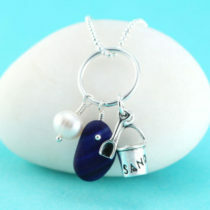 It is the chemical compound, cobalt oxide, that gives blue glass (and blue sea glass!) its appealing deep, vibrant blue color. Just a small amount of the compound, added to a molten glass melt will turn the batch blue. Adding even less will result in the lighter blue shade we commonly call cornflower or hydrangea blue. Where Does Blue Sea Glass Come From? Blue glass, especially cobalt blue (the darker hue), is one of the most popular glass colors even as far back as the 1600s when Bristol Blue Glass was introduced in England. The color had always been associated with wealth and prosperity. Blue glass was only available to the royals and others of the upper echelon who favored rare blue decanters and finger bowls. However with the introduction of Bristol Blue Glass for domestic use, the color became wildly popular. Now blue glass was widely available, more affordable and sought after as a status symbol. Much of the early Bristol Blue Glass was exported from the busting port town of Bristol, England, to the American Colonies who had yet to develop their own glass manufacturing industry. Beginning in the mid 1800s US manufactured blue glass was used for a multitude of utilitarian purposes such as bottles for soda and mineral waters, poisons such as arsenic and mercury, apothecary and medicinals including hair restorers and other radical cures. In 1916 the Maryland Glass Company began the first production of the Phillips Milk of Magnesia bottle, one of the most famous blue bottles of all time, followed by Vicks Vaporub and Noxzema Cream, all of which were packaged in blue glass up until the 1950s. Of course, that is well before the obsession with sea glass began and those old blue pieces had 25 – 50 years to tumble in the ocean before being transformed into the sea glass gems we so value today. 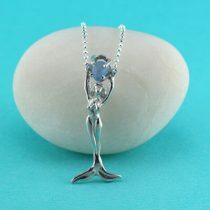 Perhaps now if you’re lucky enough to find a piece of blue sea glass, than you are lucky enough! Maybe you will find a piece of a blue jar with an embossed N for Noxzema or even an entire Evening In Paris perfume bottle! Today, interest in sea glass is at fever pitch. There are close to 20 sea glass festivals held in the U.S and Canada each year, up tenfold from the 2 that were held when I began my business, A Day at the Beach, Sea Glass Jewelry by Jane, almost 10 years ago. The business of sea glass is well, big! Hundreds of sea glass collectors from all over the world…Scotland, England, Ireland, Iceland, Wales, Italy, Israel, Spain, Japan, Nova Scotia, Prince Edward Island, Alaska, Hawaii and both US coasts…are selling their sea glass finds not only on Ebay but through dozens of Facebook groups and Instagram posts. All of this activity, as you may imagine, severely impacts the supply of genuine, surf tumbled sea glass, even as the demand for same seems to increase. And that creates value. Which leads us right into the next topic! 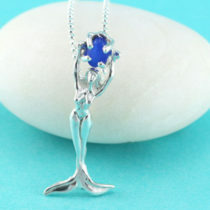 How Rare Or Valuable Is Blue Sea Glass & Jewelry? The law of supply and demand asserts that the price of a good (in this example, genuine sea glass) will eventually rise in response to an excess demand for that good. And that is why blue sea glass has great value. 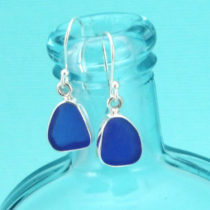 Cobalt blue sea glass is considered rare, not ultra rare like orange or turquoise, but definitely not common. On a scale of 1-10, I rate finding a pendant sized piece of fully frosted, jewelry quality blue sea glass as a 9.8. My guesstimate is that a jewelry quality piece about ½-3/4” in size can be sold for $20-35, although at an auction it could fetch an even higher price. 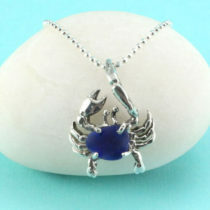 Jewelry quality sea glass is what the best sea glass jewelers strive to use in their creations. The more perfect the piece, and the larger it is, the better price it will command. To qualify as jewelry quality, or JQ, the sea glass must be naturally smoothed and frosted by the waves, tides, rocks and sand, a process which takes many years. 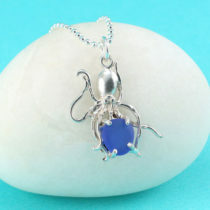 There are no visible chips or rough edges in jewelry quality sea glass. That’s not to say that a funky, unevenly shaped piece of sea glass is not pleasing. It’s all about what is appealing in the eye of the beholder. For all the reasons described above, it’s unusual today, at least where I have been looking, to find a blue JQ sea glass gem of decent size. The blue sea glass that I have found in recent years is small. Thankfully, we have been collecting for so many years that we still have lots of beautiful pieces of cobalt blue sea glass for future jewelry designs! I also think it’s called hoarding. And if you are not a sea glass jeweler or selling to a sea glass jeweler, finding that piece of blue sea glass, even if it’s not perfect, can be your best find of the day! Also it’s good for you to know that almost every beach I have explored in recent years has been “seeded” with new, broken blue glass by someone hoping to find blue sea glass in his/her future. He or she will have to wait for a while for that to happen! All blue sea glass still has value. Many artists and crafters like to use sea glass in their decorative art pieces and they love all the colors and shapes, perfect or not, as long as there are no sharp edges! 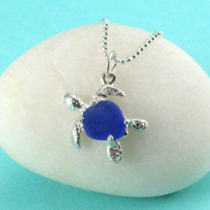 Where Do We Find Blue Sea Glass For Our Jewelry? If there is a piece of blue sea glass on the beach it should be easy to find because the color just pops out amongst the rocks, sand and lighter sea glass colors. That’s why as soon as I arrive at a beach on a hunting mission I scan the entire area looking for color (blue or red) to beckon me. Only after the initial survey of the area do I then settle in to look closer for other colors of sea glass. Most of our blue sea glass comes from our trips to California and Puerto Rico. We also purchase some from our sea glass friends in Nova Scotia, usually the larger pieces. Blue sea glass is incredibly difficult to find today. Luckily we have been collecting and purchasing from trusted partners for many years and we still have lots of pretty, jewelry quality blue sea glass for future designs. In our sea glass jewelry, the color remains one of the top two customer favorites, sharing the title with our aqua sea glass. Of course, we think all the colors are pretty, but blue, because of its deep, rich, dramatic hue just naturally attracts attention! 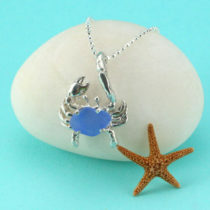 Who Should Wear Our Blue Sea Glass Jewelry? Ladies love the blues, that is one thing I know for sure. And for many great reasons. Cobalt blue sea glass is versatile, dramatic and showy in one way, yet calming and stable in another. Our lighter color, cornflower (periwinkle or hydrangea) blue sea glass is akin to the lighter blue hue of the December birthstone, Tanzanite. Cornflower blue is a quieter color, softer spoken, more delicate and serene. Either of these colors are perfect for the sea glass lover with a September or December birthstone or anyone who would love to wear a one of a kind, rare blue sea glass gem to express her individuality and sea glass style! Blues are symbolic of heaven, and who doesn’t want to feel like she is in heaven! Clear skies and calm seas are blue and beautiful. 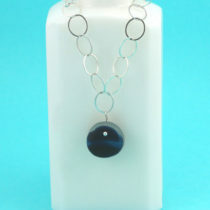 Blue is also thought to represent depth and stability, trust and loyalty, clarity and wisdom. Where red connotes aggression and dominance, blue is calm and non threatening. What’s not to like about the color for it’s universally admired by both women and men, a color that withstands the test of time. Blue is always in style. The color creates a mood of openness and tranquility in fashion and home decor. 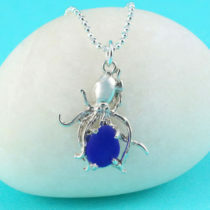 Fortunately, we still have many authentic cobalt blue and cornflower blue sea glass jewelry designs in our online boutique. Browse to your heart’s content, choose your favorite and wear it in good health. Here’s to the blues!